Cuenca (full name Santa Ana de los cuatro ríos de Cuenca) is the third largest city in Ecuador in terms of population. It is located in the Sierra, the highlands of Ecuador, nearly 8,200 feet (2,500 m) above sea level. The chief industry is weaving Panama hats. The center of the city is listed as a UNESCO World Heritage Trust site because of its historical buildings, some dating to the sixteenth and seventeenth centuries. Cuenca is a fine example of a planned inland Spanish colonial city. The original settlement was conquered by the Incas less than 50 years before the conquistadors landed. Inca ruler Tupac Yupanqui ordered the construction of a grand city to serve as a second Inca capital. Incas relayed stories to the Spanish of golden temples and other wonders, but by the time the Spaniards found the legendary city, all that remained were ruins, leaving uncertainty over what caused the city's demise. For that reason, Cuenca is considered a candidate for the mythical city of gold, El Dorado, which itself is believed to have been burned by the inhabitants themselves in response to rumors of Spanish conquests. Cuenca, capital of the province of Azuay, is located in the Andes in the southern region of Ecuador. The city ranges from 2,350 to 2,550 meters above sea level. The dominant features of the city's geography are also the source of its name: four rivers (the Tomebamba, Yanuncay, Tarqui, and Machangara, in order of importance). 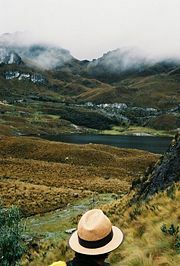 The first three rivers originate in the Páramo of Parque Nacional Cajas to the west of the city. These four rivers are part of the Amazon River watershed. Cuenca (meaning a basin caused by a confluence of rivers) is surrounded by mountains on all sides, with passes to the west, south, and east. 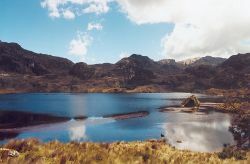 Lacs en miroir (Mirrored lakes) in Cajas National Park. The Cañari settlement called Guapondeleg is believed to have been founded around 500 C.E. Guapondeleg translates into "land as big as heaven." Less than half a century before the conquistadors landed, the Incas, after a bitter struggle, conquered the Cañari and occupied Guapondeleg and the surrounding area. Though the Incas replaced the Cañari architecture with their own, they did not suppress the Cañari or their impressive achievements in astronomy and agriculture. These, as was customary for the Incas, were absorbed into their culture. The city was then renamed Tomebamba. Shortly after the defeat of the Cañari, Inca commander Tupac Yupanqui ordered the construction of a grand city—Pumapungo, "the door of the Puma"—whose magnificence was to challenge that of the Inca capital of Cuzco. Indians relayed stories to the Spanish of golden temples and other wonders, but by the time the Spaniards found the legendary city all that remained were ruins, leaving uncertainty about what happened to the fabled splendor and riches of the second Inca capital. After being abandoned by the Cañari and then the Incas, Cuenca was sparsely populated until the 1550s. 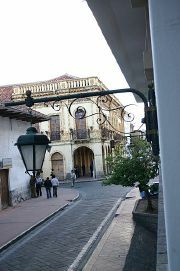 Cuenca is considered a candidate for the mythical city of gold, El Dorado. El Dorado is believed to have been burned by the inhabitants themselves when rumors arose of Spanish conquests. Tomebamba's destruction by its inhabitants prior to the arrival of the Spanish lends credence to the theory that it was El Dorado. The city of Cuenca was founded on April 12, 1557, by the Spanish explorer Gil Ramírez Dávalos. The foundation of the city was commissioned by Andrés Hurtado de Mendoza, the Viceroy of Peru at the time. Hurtado de Mendoza had the city named after his home town of Cuenca, Spain. The date of the foundation is notably later than other major Ecuadorian cities founded at the time, such as Quito (1534), Guayaquil (1538), and Loja (1548). Cuenca achieved its independence on November 3, 1820. 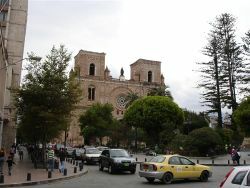 Cuenca's population and importance grew steadily during the colonial era and reached the peak of its importance in the first years of Ecuador's independence; it became the capital of one of the three provinces that made up the nascent republic. 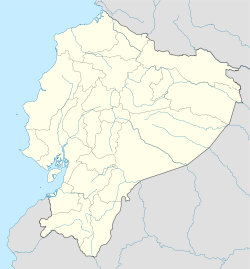 The other two capitals were Guayaquil and Quito. 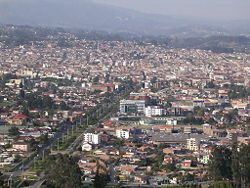 Cuenca Metropolitan Area includes the cities of Azogues, Biblian and Deleg in the cañar province and the cities of Paute and Gualaceo in the Azuay province with a population of 730,000 inhabitants, however, Cuenca's influence in the cultural, economic and educational areas extends to all the remaining cities 50 miles (80 kilometers) around. One of the region's agricultural and administrative centers, it has been a melting pot for local and immigrant populations. Much of the quinine bark of Ecuador is shipped from Cuenca, and the city is also a center for the trimming, stitching, and shipping of Panama hats, so called because of their former center of distribution. Other industries in the city are the refining of sugar, the manufacture of woolen goods and pottery, and the shipping of grain, hides, and cheese. Vendors sell handcrafted products such as shawls, metalwork, jewelry, ceramics, and clothes. Most tourists visit the historic area, which is a UNESCO World Heritage Site, located between the river Tomebamba and the streets Gran Colombia to the north, General Torres to the west, and Hermano Miguel to the east. This area's compactness, grid-like layout, and numerous readily identifiable monuments make it easy to navigate. Outside this area the city can be confusing, as there are dozens of narrow colonial streets with similar buildings. There are 52 churches in the historic area, though many are closed now due to lack of priests. The city is also famous for hosting an International Art Fair. The most impressive of the city's many museums are Banco Central, Casa de la Cultura, Conceptas Convent, Remigio Crespo Toral, Artes Populares de América, Arte Moderno, and Instituto Azuayo de Folclore. Major fiestas of Cuenca come at the time of the "Mass of Children" that is carried out the day of the Arrival of Kings (January 6, Epiphany Day), or in the commemoration of the independence of the city (November 3), during which processions, cultural acts, and dances are organized. May 2 is the Festival of the Crosses. El Septenario begins with the Festival of Corpus Cristi, which lasts eight days and includes fireworks, processions, and concerts performed by brass bands. December's Pase del Niño, a festival that mixes folklore and religion, is probably Cuenca's most famous festival. In spite of these problems, Cuenca has its strong points. It is known as the "Atenas del Ecuador" (Athens of Ecuador) because of its historical participation in culture, arts, and national politics, as well as the influence of the University. It is believed that the city's socio-economic dynamic is such that it can promote its own development on the basis of human capital, a high economic situation compared to the rest of the country, and impressive levels of public-private cooperation. This page was last modified on 24 November 2017, at 20:37.